HELLS BELLS (AC/DC), PRACTICALLY HIP (The Hip), CRUED (Motley Crue), EARLY ELTON (Elton John), CRUSH (Bon Jovi), LIQUIDCRISTAL, THIS SIDE UP, SHOOT THE MOON, & THE STRAIGHT GOODS! Early Bird > $30+HST | Advance > $40+HST | More @ The Doors! 11:30am, Showtime 12 Noon to Midnight! Bench seating available on a first come first seated basis! 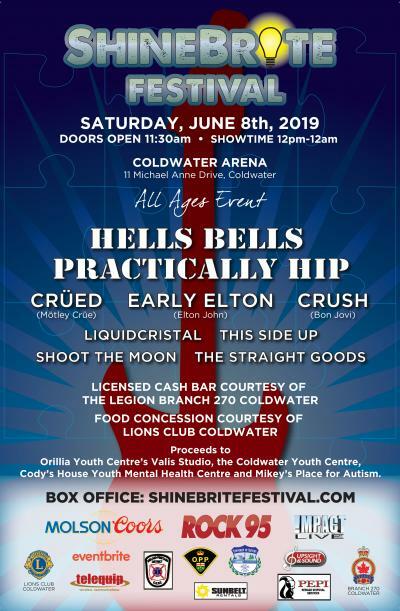 ShineBrite Music Festival 2019 takes place at the Coldwater Arena Saturday June 8th produced by Crystal Mathias Robitaille who wishes to help youth centres and mental health thru the power of live music! ShineBrite Festival will be a jam-packed 12 hour live music marathon with proceeds to Orillia Youth Centre's Valis Studio, Coldwater Youth Centre, Cody's House Youth Mental Health Centre & Mikey's Place for Autism!